Last One Left! Shabby Chic style all natural cotton personalised stocking. Homemade vintage look to this simple stocking made from 100% cotton fabric with overlocked hems and a little hanging loop to hang up in your home for the festive season. Last One Left! 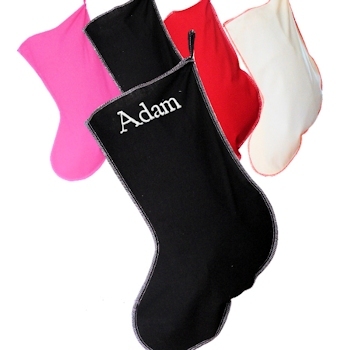 Shabby Chic style all natural cotton personalised stocking. Homemade vintage look to this simple stocking made from 100% cotton fabric with overlocked hems and a little hanging loop to hang up in your home for the festive season. Makes a great alternative to gift wrap too! Approx measurements are 41cm tall, 52cm diagonally from top to toe, 23cm width at the top.